Download "Intro to Graduate Education and Technology ED 500 Spring, 2012 ONLINE Course Outline"
1 Intro to Graduate Education and Technology ED 500 Spring, 2012 ONLINE Course Outline COURSE INSTRUCTOR: Larry Beard, Ed.D. Ph: CLASS MEETINGS: OFFICE HOURS: Online me Monday-Friday anytime. I do not check on Saturday and Sunday SUGGESTED TEXT: American Psychological Association (2009). Publication Manual of the American Psychological Association (Sixth Edition). Washington, DC: Author. 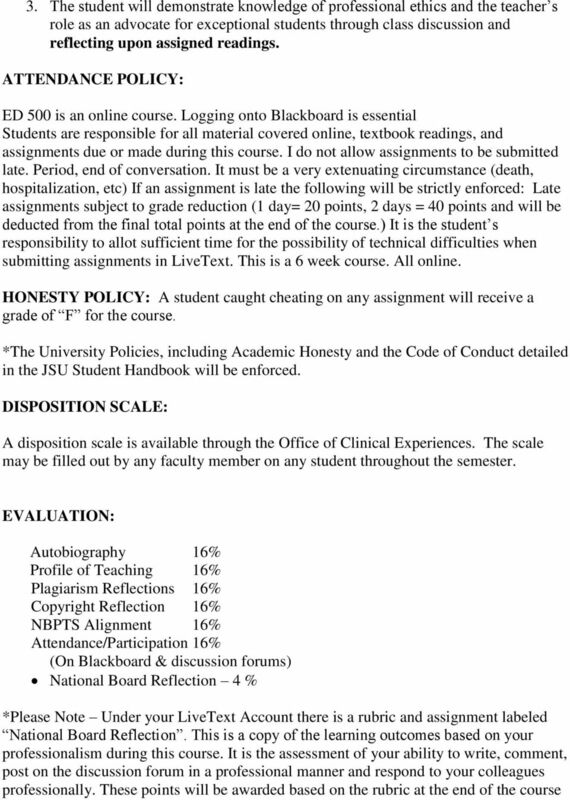 ISBN: A LiveText account is required for this course All assignments must be submitted to LiveText. I will not grade them unless they are submitted to LiveText. DISABILITY ACCOMMODATIONS STATEMENT: Any individual who qualifies for reasonable accommodations under The Americans with Disabilities Act or Section 504 of The Rehabilitation Act of 1973 should contact the Instructor immediately. 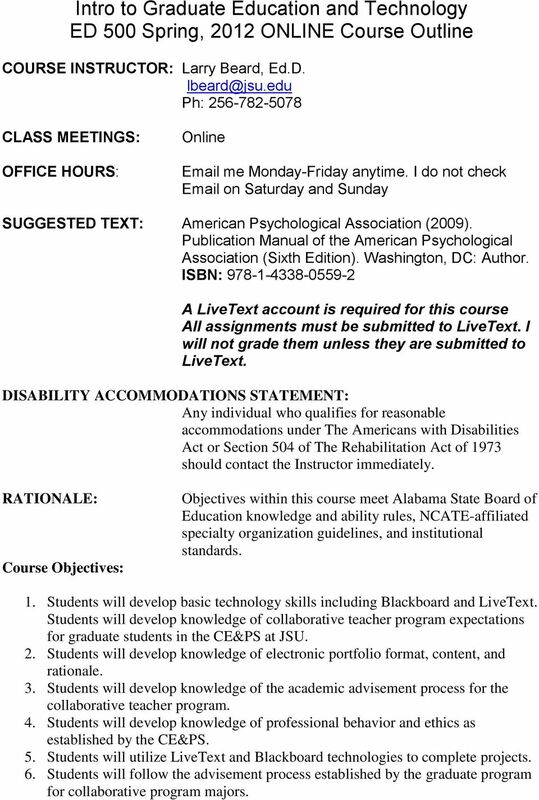 RATIONALE: Course Objectives: Objectives within this course meet Alabama State Board of Education knowledge and ability rules, NCATE-affiliated specialty organization guidelines, and institutional standards. 1. Students will develop basic technology skills including Blackboard and LiveText. Students will develop knowledge of collaborative teacher program expectations for graduate students in the CE&PS at JSU. 2. Students will develop knowledge of electronic portfolio format, content, and rationale. 3. Students will develop knowledge of the academic advisement process for the collaborative teacher program. 4. Students will develop knowledge of professional behavior and ethics as established by the CE&PS. 5. Students will utilize LiveText and Blackboard technologies to complete projects. 6. Students will follow the advisement process established by the graduate program for collaborative program majors. 2 7. Students will participate in professional behaviors set forth by the university and the CE&PS. 8. Students will demonstrate reflective practice as a professional educator. 9. Students will demonstrate reflective evaluation of one's learning style and personality type. 10. Students will recognize the importance of adhering to the ethical, best practice, and diversity standards set by the profession. 11. Students will recognize the need for continued re-examination of one's interpersonal style. 12. Students will reflect a greater acceptance of others' perspectives. 13. Students will demonstrate commitment to the policies set forth by the university and the CE&PS. COURSE OUTLINE: Topics to be covered include: 1. Portfolio Development 2. 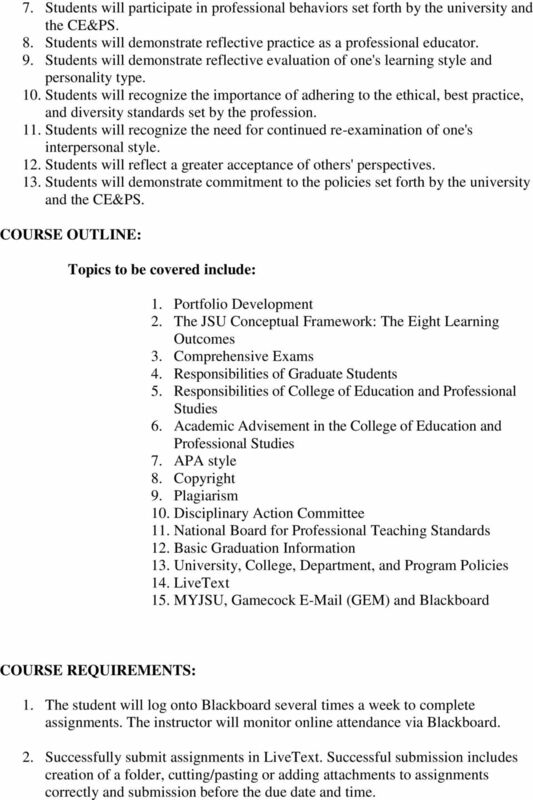 The JSU Conceptual Framework: The Eight Learning Outcomes 3. Comprehensive Exams 4. Responsibilities of Graduate Students 5. Responsibilities of College of Education and Professional Studies 6. Academic Advisement in the College of Education and Professional Studies 7. APA style 8. Copyright 9. Plagiarism 10. Disciplinary Action Committee 11. National Board for Professional Teaching Standards 12. Basic Graduation Information 13. University, College, Department, and Program Policies 14. LiveText 15. MYJSU, Gamecock (GEM) and Blackboard COURSE REQUIREMENTS: 1. The student will log onto Blackboard several times a week to complete assignments. The instructor will monitor online attendance via Blackboard. 2. Successfully submit assignments in LiveText. Successful submission includes creation of a folder, cutting/pasting or adding attachments to assignments correctly and submission before the due date and time. 4 when all assignments are submitted and the last discussion forum is finished. I will go back and review, based on your performance and add these points to your other points. GRADING SCALE: Final Grades Awarded Based on the Following Scale Percentage Grade Points % A % B % C % F 0-69 NOTES: Students must earn the grade C or better in all Teacher Education courses. All students in this course are required to successfully post all assignments to LiveText. 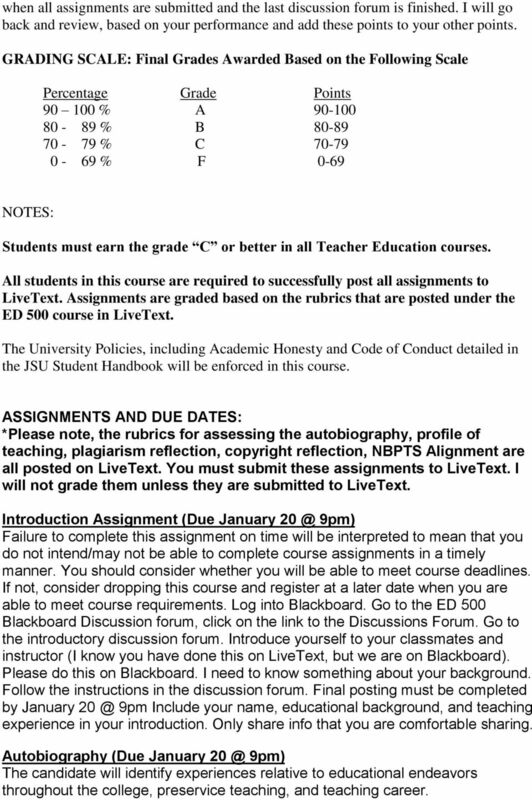 Assignments are graded based on the rubrics that are posted under the ED 500 course in LiveText. The University Policies, including Academic Honesty and Code of Conduct detailed in the JSU Student Handbook will be enforced in this course. 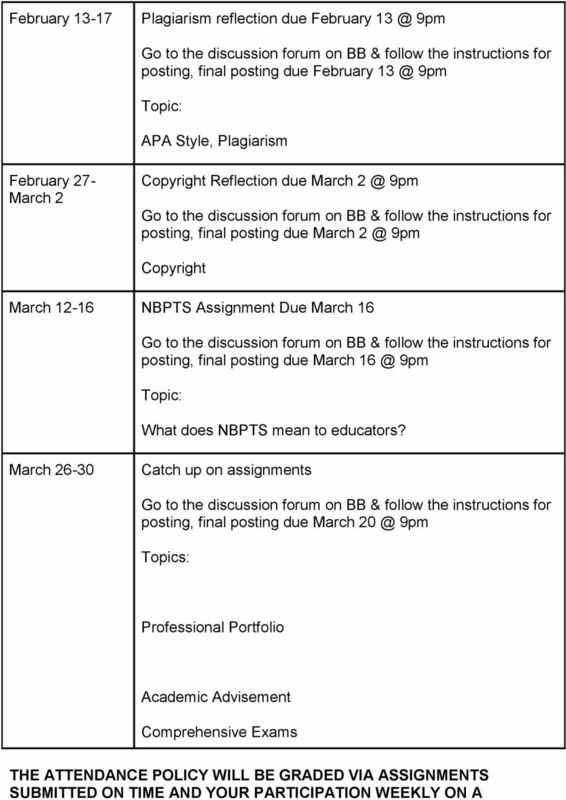 ASSIGNMENTS AND DUE DATES: *Please note, the rubrics for assessing the autobiography, profile of teaching, plagiarism reflection, copyright reflection, NBPTS Alignment are all posted on LiveText. You must submit these assignments to LiveText. I will not grade them unless they are submitted to LiveText. Introduction Assignment (Due January 9pm) Failure to complete this assignment on time will be interpreted to mean that you do not intend/may not be able to complete course assignments in a timely manner. You should consider whether you will be able to meet course deadlines. If not, consider dropping this course and register at a later date when you are able to meet course requirements. Log into Blackboard. Go to the ED 500 Blackboard Discussion forum, click on the link to the Discussions Forum. Go to the introductory discussion forum. Introduce yourself to your classmates and instructor (I know you have done this on LiveText, but we are on Blackboard). Please do this on Blackboard. I need to know something about your background. Follow the instructions in the discussion forum. Final posting must be completed by January 9pm Include your name, educational background, and teaching experience in your introduction. Only share info that you are comfortable sharing. Autobiography (Due January 9pm) The candidate will identify experiences relative to educational endeavors throughout the college, preservice teaching, and teaching career. 5 Profile of Teaching (Due February 9pm) The candidate will identify the expectations of an effective curriculum, the importance of knowledge, skills, and dispositions of an accomplished collaborative teacher, and the role of the student in an effective special education program Plagiarism Reflection (Due February 9pm) The candidate will demonstrate understanding of JSUs policy regarding academic honesty and plagiarism. Copyright Reflection (Due March 9pm) The candidate will demonstrate understanding of JSU requirements in regard to writing style and basic copyright law. NBPTS Alignment (Due march 9pm) The candidate will demonstrate understanding of the expectations of the CE&PS Learning Outcomes and the NBPTS standards for collaborative teachers. TENTATIVE COURSE OUTLINE: (Topics and dates may be subject to change). Date Assignment January Autobiography due January 9pm posting, final posting due January 9pm. 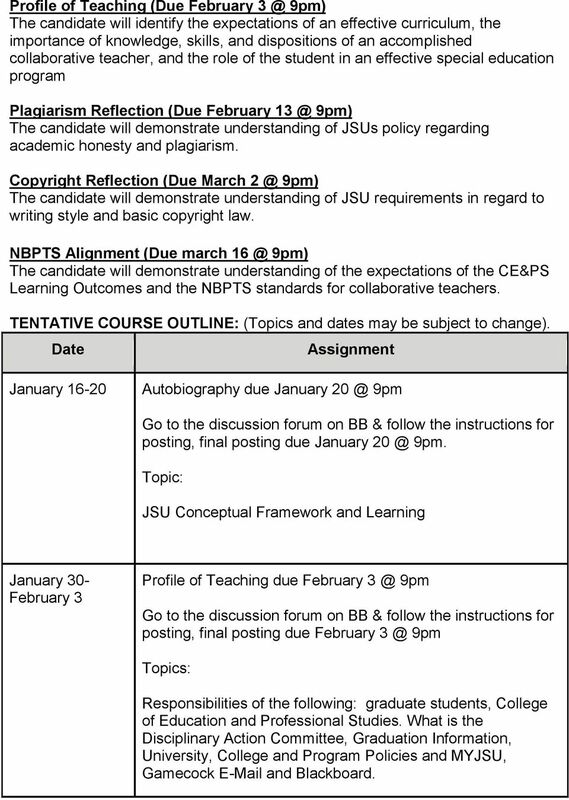 Topic: JSU Conceptual Framework and Learning January 30- February 3 Profile of Teaching due February 9pm posting, final posting due February 9pm Topics: Responsibilities of the following: graduate students, College of Education and Professional Studies. What is the Disciplinary Action Committee, Graduation Information, University, College and Program Policies and MYJSU, Gamecock and Blackboard. 7 DISCUSSION FORUM THAT INVOLVES TOPICS YOU MUST BECOME FAMILIAR WITH WHILE ATTENDING GRADUATE SCHOOL AT JSU. THE 16% ATTENDANCE WILL BE GRADED BASED ON THE FOLLOWING: LOGGING ON TO BLACKBOARD AND COMPLETING ALL THE DISCUSSION FORUMS ON A WEEKLY BASIS AND YOUR SUBMISSION OF ALL ASSIGNMENTS TO LIVETEXT ON TIME. PLEASE NOTE, I WILL NOT TAKE ASSIGNMENTS LATE. IF YOU ARE LATE, YOU WILL RECEIVE A 0 ON THE ASSIGNMENT. NO MAKE UPS. DBA 9101, Comprehensive Exam Course Syllabus. Course Description. Course Textbook. Course Learning Outcomes. Credits. LiveText (Technology Education majors. You only have to purchase LiveText once while at NCA&TSU). Instructor Information Course Syllabus Instructor: Email: Virtual Office Hours: Dr. Brent M. King brentking@adams.edu Office Hours subject to quarterly change. Please check Announcements for current times. I. PREREQUISITE For information regarding prerequisites for this course, please refer to the Academic Course Catalog. Course Description OTTAWA ONLINE ECE-30050 Early Childhood Math Methods Examines theories of cognitive development framework to understand how young children acquire math skills, concepts and abilities. Welcome to the wonderful world of business and research writing! Please Read Carefully. AEC 3033C Research & Business Writing for Agricultural and Life Science Erin Nessmith enessmith@ufl.edu 813-757-2280 Welcome to the wonderful world of business and research writing! Please Read Carefully. Course Syllabus. Email: brentking@adams.edu This is the easiest way to contact me. University of Massachusetts Lowell Graduate School of Education Issues, Mandates, and Ethics in Special Education - 05. COURSE DESCRIPTION An overview of the current issues and trends in the field of education, specifically targeting the area of teaching and learning. I. PREREQUISITES For information regarding prerequisites for this course, please refer to the Academic Course Catalog. Course Textbook: Beattie, D. K. (1997). Assessment in art education. Worcester, MA: Davis Publications. TEXTBOOK. American Psychological Association. (2010). Publication manual of the American Psychological Association (6th ed.). Washington, DC: Author. COMM 280 Intercultural Communication Online Course Fall 2015 Syllabus Tiffany Park, Instructor Telephone: 434-906-4874 E-Mail: tpark@mbc. etroy Course Syllabus - General Psychology Term 1, 2015 For course syllabus posted prior to the beginning of the term, the instructor reserves the right to make minor changes prior to or during the term.